Contemporary and stylish decor as well as fabulous sea views towards Lobos Island and Lanzarote from the first floor terrace - Villa Waikiki is a great addition to our Very Villa Plus programme. Located right in the heart of Corralejo this 4 bedroom house is only a stone's throw away from the beach, shops and restaurants! What's more the stunning beach of Grandes Playas and famous dunes of Corralejo are both just a short drive away. WiFi, a heated pool, and air conditioning/heating in bedrooms, lounge and first floor seating area are included. 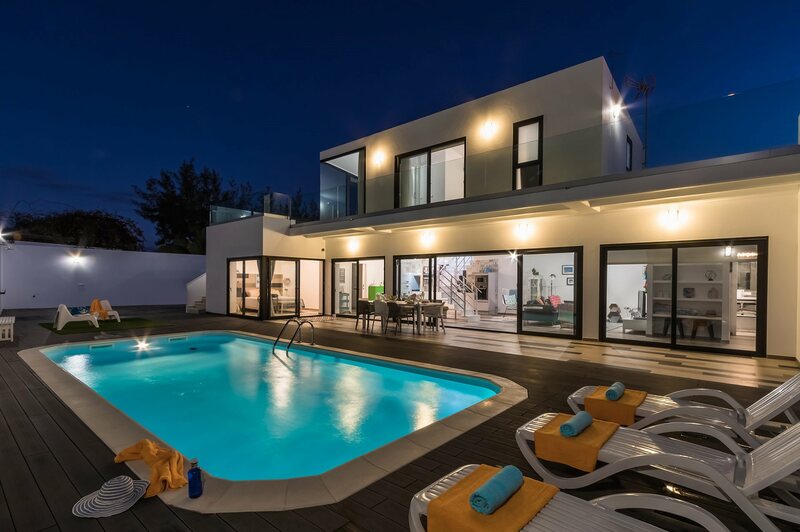 A sleek, stylish and contemporary villa, furnished to a high standard, in the heart of Corralejo - you couldn't ask for more! The outside area is spacious and contemporary. Here you'll find your private pool, which is surrounded by stylish grey decking and brown/beige tiling. The pergola runs outside the lounge overlooking the pool and makes it the perfect spot for dining alfresco. There is also a fixed BBQ and poolside shower and plenty of space for sunbeds too! Bliss! White metal gates open onto the driveway with plenty of space for parking your car if you decide to hire one. From here, a smaller gate leads to the pool area and the villa entrance on the right. The stylish and tastefully decorated open plan living room combines the lounge, kitchen and dining area. This room is airy and light floods in through the large patio doors looking out to the pool. The contemporary iron staircase is a central focal point, separating the lounge from the dining/kitchen area, with comfortable seating, a flat screen TV as well as a dining table and chairs. The contemporary style kitchen is bright, with white units, a black worktop and is equipped with all the modern appliances. There is also an adjoining pantry for your convenience. There are 4 beautifully decorated double bedrooms in total in this villa. On the ground floor there is 1 double bedroom with an en suite shower room and patio doors overlooking the pool. The remaining 2 double bedrooms on this floor look out to the front of the villa. There is also a separate stylish shower room. On the first floor there is the fourth double bedroom with a large wardrobe and a contemporary en suite shower room with an attractive exposed brickwork effect. On the first floor there is a separate seating area with the large windows framing the magnificent sea views towards Lobos Island, Lanzarote and the harbour. It is the perfect spot to relax. There is also a large flat screen TV, 2-seater sofa, small coffee table and patio door opening onto the terrace. From here, stairs lead down to the pool area. There is also a long balcony adjoining the terrace with contemporary glass flooring, leading to another large terrace on the other side of the villa. Villa Waikiki is centrally located in Corralejo. The beautiful bay of Waikiki Beach is just 140 yards away from the villa. A good number of shops, bars and restaurants are within walking distance. You can also enjoy the short walk along to the harbour. The stunning beach of Grandes Playas, which is famous amongst windsurfers, and the spectacular Corralejo dunes are both just a short drive away. There are plenty of shops to choose from in Corralejo including 2 main shopping centres - Las Palmeras and El Campanario - which both have a number of high street named shops and supermarkets. There is the local market on Tuesdays and Fridays - great for bargains! Best to get there early as it gets very popular! The bars and restaurants are just stone's throw away from Villa Waikiki. Enjoy lunch at one of the tapas bars which have typical local food from the island and cater for everyone's taste. Or by night enjoy the live music venues and eateries near Waikiki Beach with views out to the ocean. At Corralejo Harbour you will find good quality local restaurants. Many of restaurants offer home delivery should you wish to stay in. A few minutes' walk away from the villa there is Waikiki Beach, which is a secluded calm water beach ideal for children. Conveniently there is a large restaurant located on this beach. The beautiful Flag Beach and Grandes Playas Beach are both just a short drive away. El Cotillo is a small little fishing village and is dedicated to the virgin of good travel (Virgin de Buen Viaje) and these words can be seen painted on the cliffs in the old harbour. This is truly the surfing and windsurfing Mecca of the island. These monster waves have even been known to sink some of the small fishing boats that are moored there. Many experienced surfers head to the beaches of El Cotillo and those between El Cotillo and Corralejo because of these conditions. If you fancy a game of golf, Mirador de Lobos Golf Resort in Corralejo is located close to the villa. If you prefer a larger course, then there are other golf courses to be enjoyed in Caleta de Fuste located on the East coast just after the airport. You can try the go-karting track in the capitol Puerto del Rosario. Smaller karts are also available for children. Hiking tours are arranged by the local council and full information can be found in the tourist office in Corralejo. Villa Waikiki is not available to book for season as it is sold out. Take a look here at the Fuerteventura villas that are currently on sale. The Shopping Centre El Campanario is situated in the south of Corralejo and can be walked to from the centre of the town. If you are with a car, there is underground parking. It is made in the local Canarian style with colourful fronts and balconies in wood. There is also a great choice of shops and restaurants. Crazy Golf is located at the Acua waterpark in Corralejo. They have a full size crazy golf course to the rear of the waterpark.